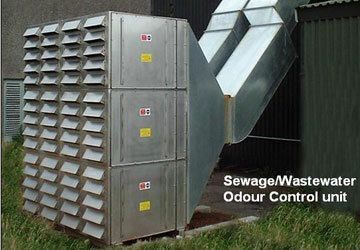 EMCEL Activated Carbon Odour Control Filters have been installed at several landfill sites in the UK and Ireland. These unique filters are mounted on the landfill vent outlet pipes to provide the natural ventilation of methane required – plus the filtration capability to remove odours, vapours and other pollutants before they are released into the environment. When sewage pumping is in progress, foul air must be vented from the system into the atmosphere. To handle the heavy concentration and volume of contaminated air generated in the process EMCEL has developed a range of highly efficient Activated Carbon Odour Control Filters. These filters are designed to meet EPA (Environmental Protection Agency) requirements and are currently in service at many sewage plants around the world, including the UK, the Maldives and the USA.